If you do not suffer from gastric irritation, you should take anti-inflammatory tablets for two or three weeks to settle down the inflammation and swelling in the knee. The anti-inflammatory tablets should be taken after eating. If nausea, vomiting or abdominal pain develops you should reduce the dosage. Prior to surgery quadriceps exercises (see below) should be performed to strengthen the knee. These should also be performed immediately after your operation on waking. A physiotherapist should visit you after the operation to assist you to stand and start your mobilisation. The physiotherapist will advise you on the exercise program and supervise your quadriceps exercises. Crutches or sticks are not usually necessary. The physiotherapist will also assist you to try bending the knee a little. When you are comfortable and able to walk, and the nurses and physiotherapist are happy with your progress, you may be collected and taken home. This is usually 5 pm for morning cases and 8 pm for afternoon cases. Arthroscopic knee surgery is one of the most common, most successful and safest surgical procedures undertaken. The success of arthroscopic menisectomy in relieving pain and allowing a return to sporting activity is in the region of 98% of patients. 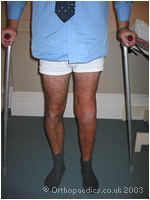 The recovery is usually rapid within 2-3 weeks and complete. The incidence of any complication is very low and usually less than in 1% of cases. This is less than the incidence in open knee surgery. Possible complications include anaesthetic risks, infection, venous thrombosis, stiffness, further pain and a recurrent tear of the meniscal remnant. Infection may present by the knee becoming hot, swollen, throbbing and painful after 1-2 days. Venous thrombosis presents with a swollen tender calf muscle, a swollen foot, or intermittent pain in the chest on deep breathing. If any of these or any other complications arise inform your general practitioner immediately. Where degenerative changes are present in the knee the improvement may be limited and the symptoms may return because of progressive degeneration over the course of time. If your job is sedentary and mostly sitting you may wish to return after only 1 or 2 days. If your job is physically demanding and requires standing or walking for most of the day, your return to work may take 1-2 weeks. Driving can usually be performed for short periods after 2-5 days providing that the knee is pain free and you are able to control the car with foot pedals and make an emergency stop. Light cycling, swimming, weight training or jogging may be undertaken after 7 days. This will speed up the rehabilitation and should be performed prior to undertaking more vigorous sports. Return to running, soccer, rugby and squash is usually after 1-4 weeks depending on individual progress. The first follow up appointment is usually arranged for 2-3 weeks after surgery. Physiotherapy should be started soon after surgery, usually 3-5 days later and continued 2-3 times a week for 2-6 weeks depending on the individual patient's progress.